The back of our van was shamefully full as we brought some items to store with my in-laws that we did not wish to leave unattended in storage. The rear seat between Hunter and Ashlyn was ridiculously heavy-laden with library books as we seem to be sucking all the remaining marrow out of the bones of our library cards before we tearfully say good-bye to easy, free accessible literature. 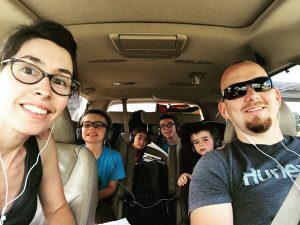 The middle row was filled with a cooler of snacks between our younger two boys and Trent and I smiled deeply from the front as we hit the road once again with our family in tow. Sad moment: Realizing we hadn’t packed Tanner’s favorite stuffed animal. Thankfully, it’s not a “must have” item and he was forgiving of my oversight. Glad moment: A few hours into the trip I took notice of the blissful quiet and realized we’d hit a monumental milestone. For the first time, all six of us were enjoying our own audio books for an extended amount of time, thank you to all the narrating fairies in audible land*! As a proud introvert, I took a photo to commemorate the magical moment. 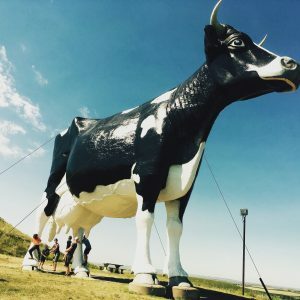 Just for fun on our way through North Dakota we decided to visit Salem Sue, the world’s largest Holstein Cow. 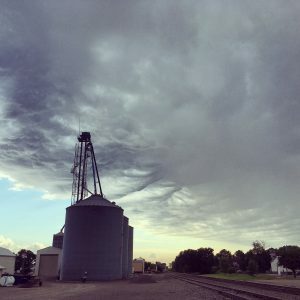 And as we pulled near our final destination, the clouds rolled in as well bringing equal parts humidity and absolute awe as I rolled down my window to fully take in the view (self-proclaimed cloud lover here). The week ahead held some fun surprise events for us. I’ll share those next time. Until then, if you haven’t already, I invite you to follow us on instagram where I regularly post photos of our family’s adventures. While you are at it, feel free to also subscribe to our YouTube channel. We’d love to reach 100 subscribers (enabling us to customize the URL of our channel) so if that gives you extra motivation to click over, s-wonderful! *My audible link is an affiliate link meaning if you opt to click on it you will be redirected to Amazon where you can read about the audible membership option and learn that you can sign up for a 30 day free trial and get 2 free audio books in the process. The 2 free books are yours to keep even if you do not continue your membership. As a thank you, Amazon offers me $5 if you decide to sign up for their free trial. I have love, love, loved our audio books through Audible. If desired, we can share each book in our collection across all of our devices and listen to them at our own rates. On the rare occasion that we have not liked a book, I was able to return it for a full refund with a simple click of a button. Try it out for your next road trip!